A glitchy procedural, infinite-ish landscape demo running on Android and OUYA. Use the left joystick to move around on OUYA, or swiping on Android devices with touchscreens. Here’s the apk, and the source is here. It’s great to be able to have a single binary that works across all these devices – from OUYA’s TV screen sizes to phones, and using the standard gesture interface at the same time as the OUYA controller. The graphics are programmed in Jellyfish Lisp, using Perlin noise to create the landscape. The language is probably still a bit too close to the underlying bytecode in places, but the function calling is working and it’s getting easier to write and experiment with the code. This lisp program compiles to 362 vectors of bytecode at startup, and runs well even on my cheap Android tablet. The speed seems close enough to native C++ to be worth the effort, and it’s much more flexible (i.e. future livecoding/JIT compilation possibilities). The memory layout is shown below, it’s packing executable instructions and model data into the same address space and doesn’t use any memory allocation while it’s running (no garbage collection and not even any C mallocs). The memory size is configurable but the nature of the system is such that it would be possible to put executable data into unused graphics sections (eg. 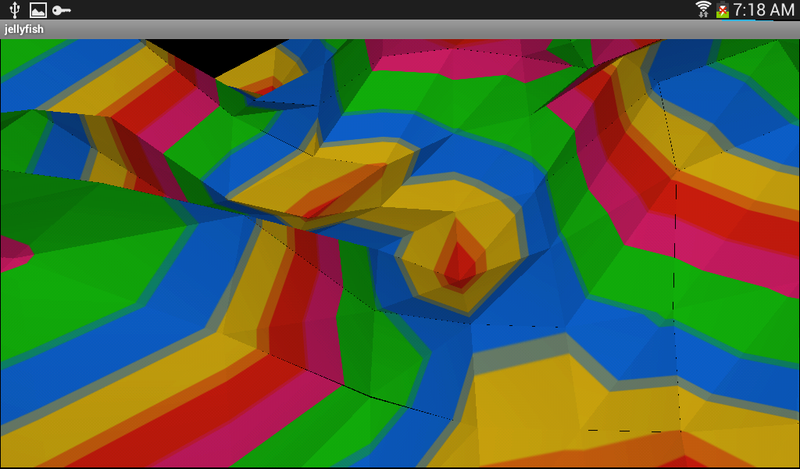 normals or vertex colours), if appropriate. Wow! Please post more on this, I’ll be trawling your archives after work for more info on this. It seems very cool!